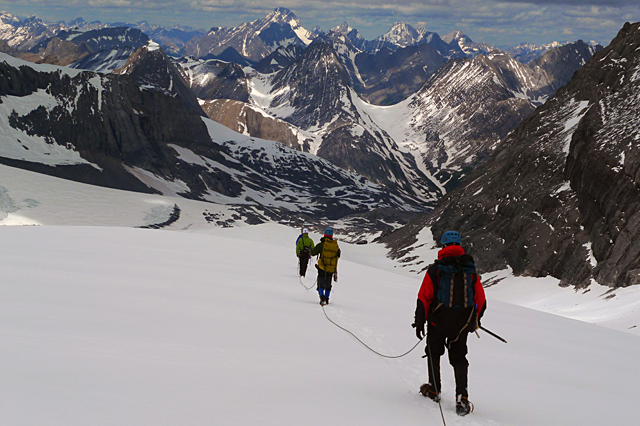 Organizing your own private Canadian Rockies mountain climbing trips can be extremely rewarding in terms of what you achieve. This is because the pace of the activity depends upon you and your group, there is no compromise involved as the sole aim is to satisfy your goals. Perhaps our scheduled program dates don’t work for you. 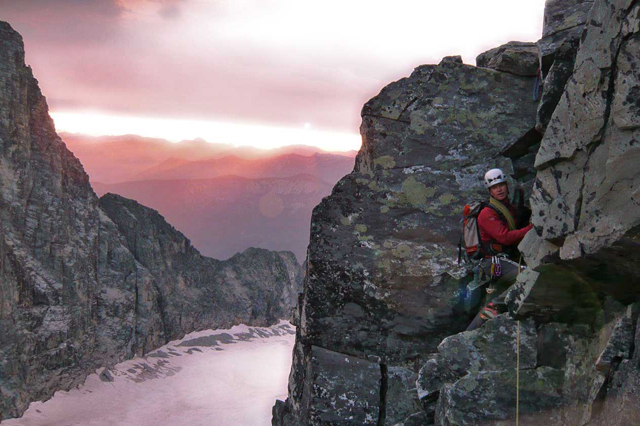 You can still enjoy our mountain climbing vacations but on a more exclusive basis. 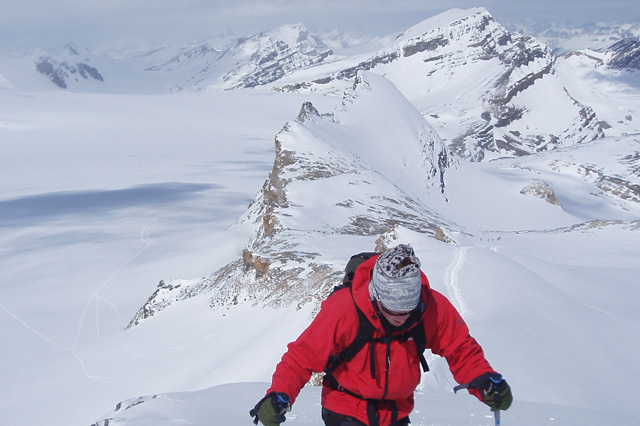 There are a multitude of fine climbing areas, alpine traverses, unique expeditions and adventures that are not in our brochure. If you would like to do something different in the mountains then consider a custom trip. In the past we have operated private trips not only in Canada but also in Antarctica, Asia, Europe, Mexico, Bolivia and Peru. 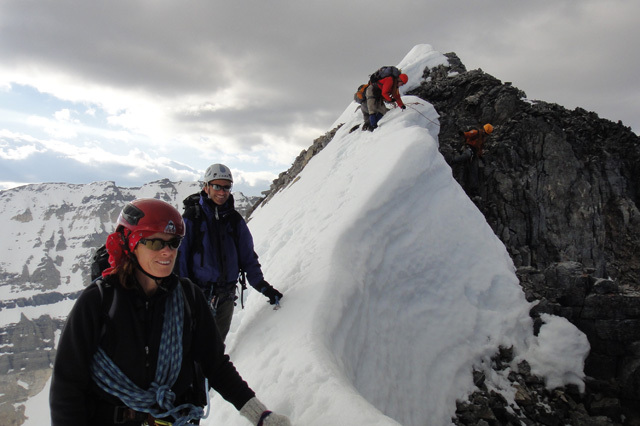 Hiring a Private Mountain Guide for your adventure can provide a very high quality experience for you and/or your climbing partners. Your guide will be completely focused on your objective. The highways that traverse the Rockies provide easy access to a wonderful variety of peaks and make rewarding day climbs possible. 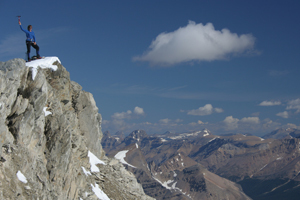 From Canmore, Banff and Lake Louise you can book climbs for one day or several. Kananaskis Country and the Rocky Mountain National Parks (Banff, Jasper, Kootenay and Yoho) are all possible day destinations (Jasper is further away and you may be better staying at one of the hotels or hostels along the Banff-Jasper Parkway). Typically these climbs are mostly on rock with some snow in the early season. Private Day Climbs are easiest to organize and involve the fewest costs, typically just guide fee plus gear rentals, if you are supplying transport. Mount Edith: 2554m. An easy rock peak with a little 5.4 rock just N. of Banff. Allow at least 8 hours, elevation gain of 1200m. June – October. Mount Rundle: 2949m. A big (elevation gain 1500m) but easy peak right above Banff. By the ‘hiking’ trail it’s mainly steep hiking, not technical at all. If you follow the ridge from the Golf Course you’ll quickly think you’re much higher as you encounter enjoyable 4th and easy 5th class terrain, drop back to valley when you’ve had enough. June – October. Mount Temple: 3544m. A long but easy scramble with some cliff bands leads to the summit of the highest peak in the Lake Louise area with an exceptional view. Big elevation gain of 1500m. Requires a minimum of three guests from July – September, but we can add other guests to your party if you don’t have enough in your group. Mounts Whyte & Niblock: (2983m. & 2976m.) These two peaks, right above Lake Louise, offer a more alpine climbing experience than the others in this section. Mid-June – September. Castle Mountain: 2760m. Towering above the Bow Valley this rocky monolith can be done in a long day from the valley or eased with an overnight in the hut part way up. There are several routes including Eisenhower Tower with some 5.5 or the spectacular Brewer’s Buttress which is 5.7. both involve about 10 pitches of roped climbing. June – September. Mount Aberdeen: 3151m. 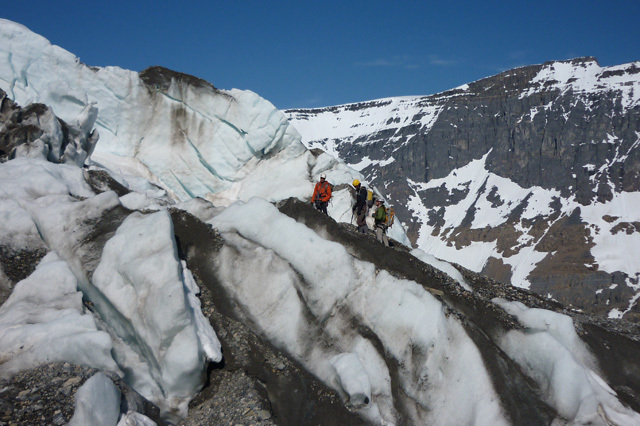 This alpine peak right above Lake Louise involves a 1524m (5000 ft.) gain, a steep glacier and spectacular summit. June – July. Mount Louis: 2680m. This spectacular limestone spire rises just north of Banff. The Kain Route with the Perren finish is a Rockies classic (5.7). June – September. There are also many great multi-pitch rock routes in the area such as those on Yamnuska, East End of Rundle and Ha Ling Peak (Chinaman’s). These are better outlined on our Private Rock Climbing page. Yamnuska guides are the best in the industry. Our standards are very high and we are totally committed to providing you with the best possible experience. Our guiding team benefits from staff training, peer and client review, daily conditions reports, and support from supervising guides. We back up all of our programs with a full time, on-call Duty Manager and office staff support network ready to help in any situation. We also have cutting edge, modern equipment ready to rent or borrow on all of our programs. 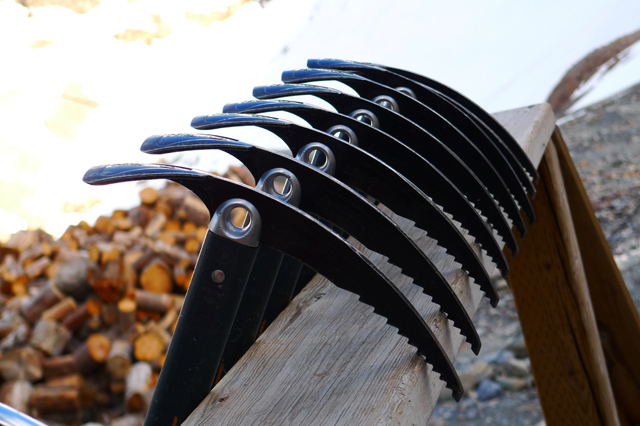 We are the oldest mountain school and guiding company in Canada for a reason – we consistently meet our clients’ objectives. When you arrange a private or custom program you will be paying a guide fee plus the expenses incurred in running the program. It is important to understand that should you wish to shorten your trip due to weather or personal reasons you will still be paying for the entire duration that you registered for. This is an outline of the typical costs involved. These costs do not include Goods & Services Tax (GST) which is usually 5%. Gratuities are not included. Before booking your private program we will give you a final quote as to cost. The fees below are set by the number of people in your group. The guide to client ratio will be determined by the difficulty and technicality of your objective. For intermediate and advanced climbs we recommend no more than a 1 guide to 2 client ratio, for beginner level ascents and basic instruction ratios can reach 1:6. 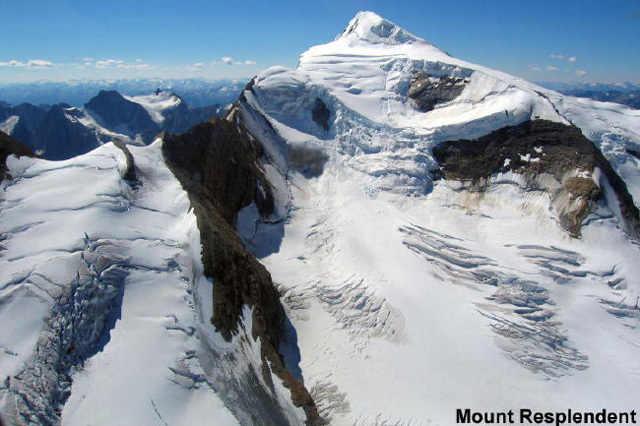 Where climbs are more difficult, serious and/or long (for example Mounts Assiniboine, Louis, Robson, Sir Donald; Chouinard-Beckey on Howser) a surcharge will apply. We will advise you of this surcharge should it be applicable. Our quote will include costs for your guide’s expenses during your program. These include driving costs (unless you drive the guide), accommodation & meals (doesn’t apply to local day climbs), helicopter costs etc. National Park Fees: If we climb in Banff or the other National Parks entry fees apply (about $10/day/person) and if we overnight in a hut or camp in the backcountry a further $10/night/person Wilderness National Park Fee applies. Helicopter Access: Some backcountry areas (e.g. B.C. 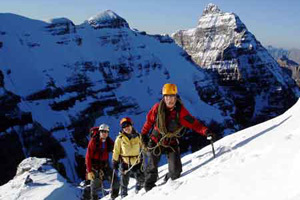 Interior Ranges, Mount Robson, Assiniboine) are best accessed by helicopter. Where the fee is fixed we can include that in our package price, where it may vary we will give you our best estimate and arrange for you to pay the helicopter pilot directly. Porters: We can arrange for a porter to help on access climbs and on backpack trips to lessen your loads. In the winter or avalanche terrain we may require that two porters travel together for safety purposes and to meet provincial regulations. You will either need to provide the transportation for you and the guide or, should the guide need to drive him/herself to the program area then a charge, based on distance will apply. This ranges from $20 on up depending upon where you go. Once we know whether you will be able to drive the guide or where you will be going we will include transport costs in your quote. Yamnuska has several 15 passenger vans and we can supply transportation for your group using these. We can quote you a cost for this which will also depend upon how far you are driving and how much the vehicle will be used. For accommodation before and after a program or during a program involving day trips from either Canmore, Banff or Lake Louise, there are a variety of accommodations available. During a program you may find yourself camping, using mountain huts and hostels or even staying in hotels. Thus the cost of trip accommodation will vary with what you choose. Backcountry camping may involve minimal cost, National Park Campgrounds such as those at the Columbia Icefields cost $16 per tent per night. Mountain huts operated by the Alpine Club of Canada average $30/night/person (guides free). In constructing your private program we can include the cost of accommodation for you. The actual costs will be outlined in the quote. Yamnuska can supply all your out-trip meals. Should you choose to supply your own we charge you only for the cost of your guide’s food. In planning your menu we will need to know of any special dietary restrictions or preferences you may have (e.g. vegetarian) and of any allergies you may have (e.g. shellfish). A dietary surcharge will apply. Food charges will be prorated where less than 3 meals are supplied in a day. Included in the charge is supply of group cooking gear (stoves, pots & pans). For larger groups we can also arrange for a cook when requested and appropriate (mountain huts & campsites). Group safety & technical gear (e.g. ropes & rack) is included in the guide fee. You will need to supply personal clothing and gear (e.g. ice axe, crampons, helmet & harness). Some of these items can be rented and the cost included in your package price. We will supply you with a quote which will include all expenses such as meals, accommodation and rental gear when we know your requirements. Registration requires a deposit of one third of the quote or, for trips of three days or less, full payment. All guests must fill in an application form and an experience questionnaire. We accept, Visa, Mastercard, money orders, money transfers, travellers cheques and canadian dollar certified cheques. If you need any rental gear please let us know early to ensure its availability. Why choose a private program? You would typically choose a private mountain guide or custom program when your objectives, schedule and expectations are not matched by those offered on our scheduled trips and courses. All scheduled programs and courses featured on our site can also be modified to suit you or your groups needs, be it in terms of dates or length of trip. Otherwise, let us know your objectives and we’ll customize a trip for you. 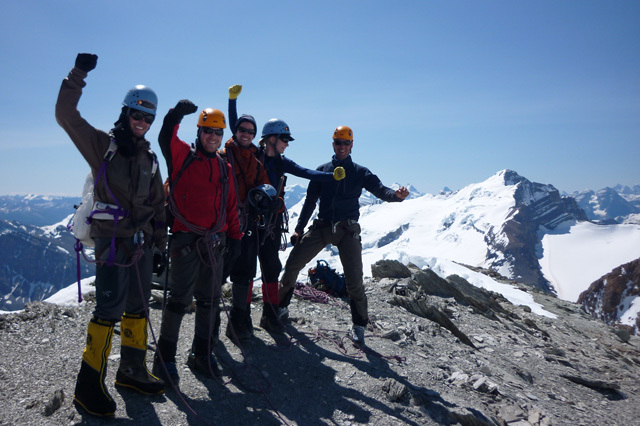 You can hire a guide/instructor to do any of the activities in which we specialize: mountaineering, rock climbing, backcountry skiing, ice climbing, ski mountaineering and alpine hiking. 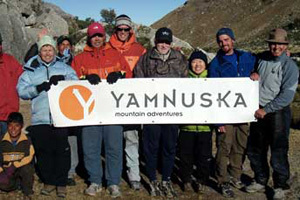 Yamnuska guides and instructors are certified by the Association of Canadian Mountain Guides. In addition to certification, which only relates to a guide’s technical competence, all of our guides have access to Yamnuska’s staff training and guide mentoring programs which help to develop many other key qualities required of a well-rounded professional guide. They need to be endowed with patience, empathy, and a sense of humor as well as being effective communicators and great coaches. As Canada’s oldest mountain skills instruction school, our safety and risk management plans are unmatched. A full-time, on-call duty manager ensures that we are prepared to deal with any emergency or program requirement around the clock. Our rigorous safety policies and procedures have been developed through our experience from more than 30 years of training and working with military and first responder organizations from around the world. We also offer a full service backcountry kitchen, and guide’s lounge for your comfort and convenience. 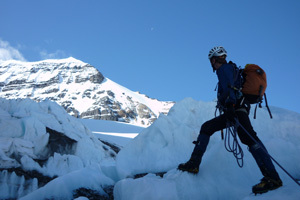 We maintain an inventory of quality technical mountain gear for you to use on our programs. Other guiding companies meet you at a coffee shop or a grocery store parking lot – we meet you at our comfortable office. Our kitchen is a fully inspected and certified provincial restaurant. If any guiding company is offering to provide food for a program it must be from a provincially approved facility. 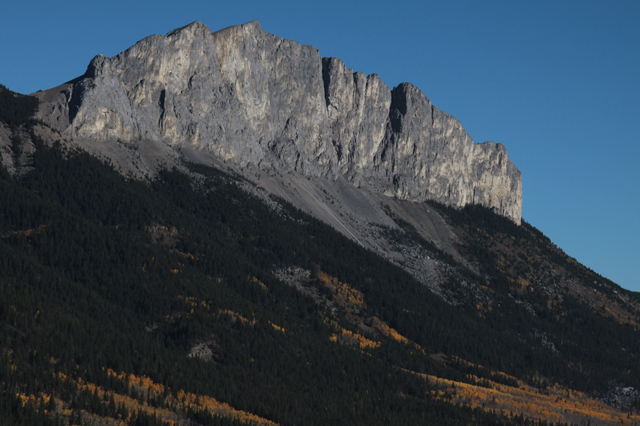 If you would like to arrange a private climb or custom program please contact us directly, by email at info@yamnuska.com or by phone (403) 678 4164, to discuss with us what you are interested in doing. We will listen to your objectives, experience and expectations in order to design a program that best suits your needs. We will confirm price and itinerary with you at which point you would book by making the appropriate deposit. We can handle virtually all logistical requirements. Custom trips are based on private guiding rates, guide to guest ratios and the type of adventure or program you request.